Howard Rosen, Esq. March 23, 2015 No Comments on SO YOU THINK YOUR HOMESTEAD IS PROTECTED? Think Again! © 2015 Donlevy-Rosen & Rosen, P.A. BACKGROUND. Florida and Texas state laws provide generous homestead (creditor) exemptions. Under Texas law, if one’s homestead is an “urban” home, up to 10 acres and improvements are exempt from seizure by creditors, and up to 200 acres are so exempt if the home is a “rural” home occupied by a family (100 acres if occupied by a single individual). Florida exempts up to one-half acre if the home is located within a municipality, and up to 160 acres if the home is located outside a municipality. Both Florida and Texas homestead exemptions are unlimited as to the value of the property to be exempted – only property size limits the exemption. These homestead exemption laws are well respected by the state courts of Texas and Florida. A problem can arise, however, when one goes through bankruptcy, which is a federal court proceeding. Even so, depending upon the state in which a debtor resides, the debtor may be able to utilize the state-law provided creditor exemptions in the federal proceeding. Prior to 2005, the wide variety of state-law creditor exemptions, particularly the homestead exemptions, resulted in vastly different outcomes for a debtor in a bankruptcy proceeding in one state compared to a debtor in a bankruptcy proceeding in another state with the same set of facts. Since bankruptcy is a federal proceeding, Congress felt the bankruptcy proceeding outcomes should be comparable in every state. Thus, on April 20, 2005, the Bankruptcy Abuse Prevention and Consumer Protection Act of 2005 (the “Act”) was enacted into law. 1215 DAYS. One change to the bankruptcy code which received attention almost immediately was the revised homestead exemption amount (See, APN, Volume XV, Number 1). The Act provides that a debtor must reside in the homestead property sought to be exempted for 1215 days (about 3 years, 4 months) prior to filing the bankruptcy petition, and may only claim as exempt the value of the homestead interest owned for such 1215 day period. If this requirement is not met, the Act provides a maximum homestead exemption of $125,000. THERE’S MORE: Although value transferred from a previous homestead in the same state is grandfathered into the value of the homestead sought to be exempted, any value resulting from a conversion, within 10 years of filing the bankruptcy petition, of nonexempt property into homestead property with the intent to hinder, delay, or defraud (defeat the claim of) a creditor will not be exempted. For example, a debtor gets sued, and then liquidates his (non retirement, nonexempt) brokerage account to pay down the mortgage on his homestead or to acquire a homestead. Four years later, after an adverse judgment is entered against the debtor, he files for bankruptcy protection. Under the described “conversion” limitation, even assuming all the residency/ownership requirements are met, the value of the homestead exemption will be reduced by the amount of the nonexempt assets (his brokerage account) infused into paying down the mortgage on his existing homestead or in acquiring a new homestead. Ten years is a very long time to wait for full homestead protection. WHAT YOU CAN DO. 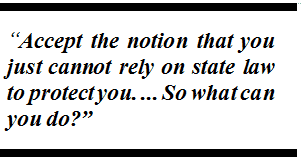 Accept the notion that you just cannot rely on state law to protect you. While you may never intend to file for bankruptcy protection, you might end up in an involuntary bankruptcy proceeding – that is, it may not be your choice. So what can you do? You have to make your homestead (and any other real property you own) unattractive to a creditor – not worth the trouble to go after. How do we make such assets unattractive to the creditor? By removing their value. How do we remove their value? By encumbering them (using the asset as collateral for a loan from an unrelated lender). OK. Once we have pledged the asset as collateral for a loan, are the loan proceeds reachable by the creditor? They would be, unless the loan proceeds have been protected by depositing them in your offshore asset protection trust. Remember: The loan is made by a lender unrelated to you, and the U.S. Constitution prohibits a U.S. court from ignoring the fact: A stranger has entered into a fair value transaction with you, and that stranger has a property interest (mortgage lien) which cannot be taken away. With this type of loan structure, anyone searching the public records to see what you own would find your properties AND significant liens against those properties (i.e., little or no value to go after). Think about it: If all I had was a property worth $1,000,000 with a $950,000 mortgage on it, is it worth your trouble to sue me? After paying your lawyer, what would you recover? CONCLUSION. Utilizing competent counsel, you can take matters into your own hands and effect true protection for your homestead and other real estate assets – not dependent upon state or federal law.